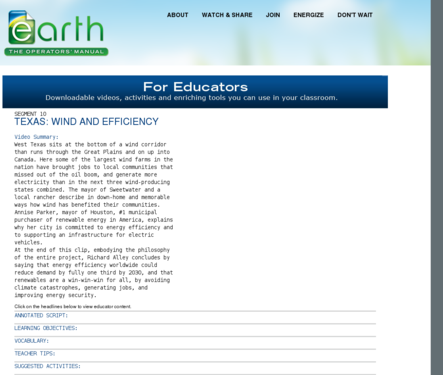 This engaging video could be used to kick off a module about wind energy. This video segment that follows this one (segment 10) is also relevant to facilitate a discussion on renewable energy. See: http://earththeoperatorsmanual.com/for_educators for the full program. The statement that,"energy efficiency worldwide could reduce demand by fully one third by 2030" is debatable. Some experts say that long-term energy demand actually increases with increased energy efficiency because energy efficient devices have more applications. This is a debated topic, and this [link http://www.newyorker.com/magazine/2010/12/20/the-efficiency-dilemma 'New Yorker essay'] gives a helpful summary. Numbers given are not cited, but scientist Richard Alley is a reputable and well-known leader in climate science. Discusses pros and cons of wind energy (emphasizing pros) and the need for continued research into renewables and energy efficient technology. The 2030 energy portfolio proposed is overly ambitious and would require an unlikely build-out of renewable energy infrastructure and technological development. 2016 update: renewable energy is scaling up rapidly. Educators are advised to seek up-to-date information and present current statistics and projections along with this video. Comments from expert scientist: Good overview and outlook. No major problems. The host, Richard Alley, is a well-known climate scientist and models exemplary skills in communicating complex information to a wide audience. Shows how wind is a potential energy resource in West Texas, which sits at the southern end of the US wind corridor. Talks about how "green energy" translates to economic gains for some stakeholders in communities. An annotated script, learning objectives, vocabulary, and teaching tips are provided. Learning activities are suggested, including one that is in the CLEAN collection.